Just before Christmas my fiance and I went on a Costa Deliziosa Cruise to the United Arab Emirates leaving from Savona, Italy. The cruise headed for Dubai, the main stop of the cruise itinerary but not the only one. From Dubai we headed to Abu Dhabi and visited other places like Bahrain, Fujairah and Muscat, all part of our 20 day Costa Deliziosa Cruise. Where do I start, the cruise ship, the crew, the quality of it all? The food was excellent, the staff superb and the ship had all the features you would appreciate in a high end boutique hotel. 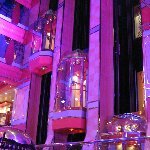 It was an amazing journey and it totally changed my opinion on cruises and cruise holidays in general! Of course, you won't be the only person on board but it really is a luxurious way of travelling and a great way to visit a city like Dubai. After a day of sightseeing we returned at the ship where there were all sorts of options to make it through the evening from restaurants and theatres to casino areas, bars, swimming pools and lounge rooms. There was enough and more of everything! I'll add some pictures of the Costa Deliziosa Cruise Ship in the picture gallery and will be back to share more about my travel experience in Dubai and the other places we visited during our holiday in the United Arab Emirates. Did you enjoy Costa Deliziosa Cruise to Dubai Review and have you been on a holiday in Dubai, United Arab Emirates? 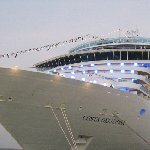 Where to stay in Dubai: Costa Deliziosa Cruise Ship. What to do in Dubai: Book a 20 day cruise starting in Italy or fly into Dubai and depart from there, both options are great I find. Where to eat in Dubai: Where not to eat! There was so much to choose from, pasta's, seafood, meat, vegetables, fruit, not to forget, desserts! Liked: The food, the staff, the design of the rooms, the whole travel experience and how well everything was arranged. Disliked: The way back home..